Consumer advocate Ralph Nader will be the keynote speaker at the National Floor Safety Institute’s (NFSI) Slip, Trip and Fall Prevention Symposium, slated for April 28 at Emory. 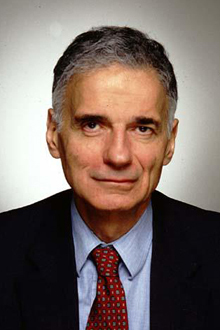 Consumer advocate Ralph Nader will be the keynote speaker at the National Floor Safety Institute’s (NFSI) Slip, Trip and Fall Prevention Symposium to be held April 28 on the campus of Emory University. Emory is serving as a co-sponsor of the symposium. Nader, who has been an outspoken advocate for consumer safety for more than 50 years, will speak at 7 p.m. in White Hall 208 on his work and how our society should address the growing slip-and-fall crisis. Ticket information is available by contacting Emory faculty member Mark Fagiano, at 404-727-0164, or mfagian@emory.edu. "Accidental falls are the leading cause of emergency room visits in America and the leading cause of accidental death for the elderly," Nader says. "We as a society largely ignore this." Nader’s talk will cap a full-day event featuring eight prominent speakers from legal, governmental, insurance, medical, architectural, academic and manufacturing industries, says NFSI Founder and President Russell Kendzior. The symposium is being held from 8 a.m. to 5 p.m. in White Hall. Admission for the full symposium is $300, and registration information is available at NFSI.org. NFSI symposium speakers will include Ed Foulke, former assistant secretary of labor for the Occupational Health and Safety Administration (OSHA); Shari Falkenburg, assistant vice president of CNA Risk Control; and David Watterson, vice president of Mountville Mills, the world’s leading supplier of commercial floor mats, among others. Kendzior, who will also serve as emcee of the symposium, says that participants are attending from as far away as England, and include staff of the Consumer Product Safety Commission and OSHA. "Emory University’s sponsorship and Mr. Nader’s five decades of success in calling public attention to safety issues make this event a must-see for advocates, safety professionals and anyone interested in good news about improving public safety," Kendzior says. Fagiano, visiting assistant professor of philosophy at Emory, was instrumental in inviting the NFSI to hold its annual meeting on campus and will speak at one of the sessions. Fagiano’s topic? Empathy. "The media often portrays slips, trips and falls as acts of fraud," says Fagiano, who is teaching a course this spring on "Empathy, Sympathy and Compassion." "While this is true of certain contextualized situations, the actual causes of these incidents paint a more complex picture, which this symposium will highlight." The National Floor Safety Institute, a 501(c)(3) organization headquartered in Southlake, Texas, was founded in 1997 to aid in the prevention of slips, trips, and falls through research, education and standards development. NFSI’s 15-member board represents product manufacturers, insurance underwriters, trade associations, medical and legal professions, and independent consultants.